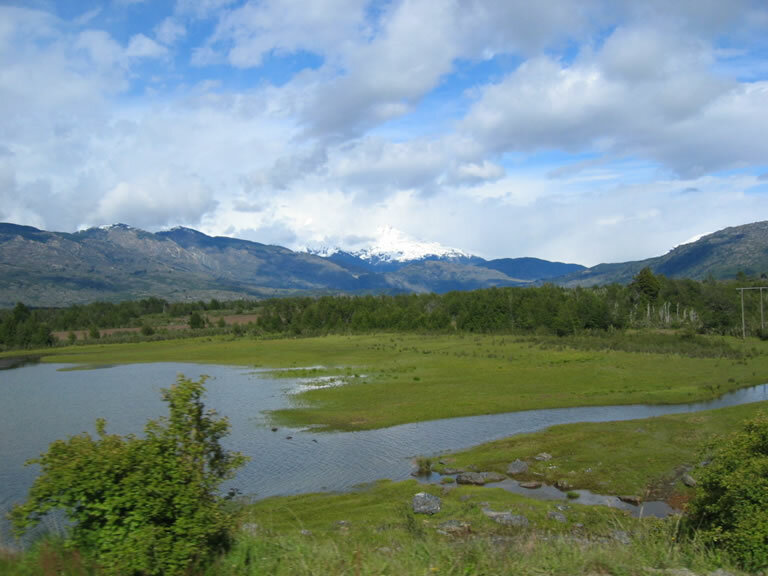 We awoke the next morning to brighter skies and headed to Puerto Bertrand, the Carretera Austral continuing to follow the western shore of the Lago Carretera. South of El Maiten the road divides - the left fork heading for the Chile Chico crossing into Argentina and the right fork remaining on the Carretera Austral. We took the right fork, the road becoming steeper and more windy. Luckily it wasn't winter - this section of road to Puerto Bertrand can be dangerous at that time of year with its narrow sections and frequent blind bends. Puerto Bertrand is a small village on the shores of Lago Bertrand, a supposedly bright blue lake. We drove down to the lake to have a quick look but it wasn't quite as scenic as we were expecting. As you head out of the village there are lots of high end fishing lodges, reportedly very luxurious with a price tag to match. We quite fancied doing some fishing at some point on the trip but all the lodges seemed to be pretty extortionate and you needed to spend a few days to make it worthwhile. From Puerto Bertrand the road continues to climb up to high moorland and about 20km south of the village there is a mirador just off the road where you have a fantastic view into the valley below and you can appreciate the stunning sight of the confluence of the Rio Baker and Rio Nef - whilst the Nef is blue, the Rio Baker is a bright turquoise and the contrast is very evident where the two join. As the road continues south you get frequent views of the bright Rio Baker until you come closer to the small town of Cochrane. 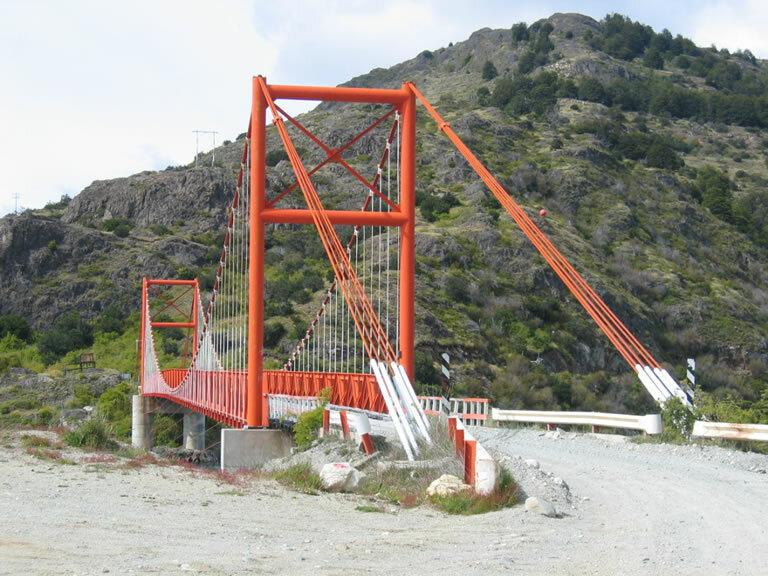 The road becomes fairly rough as you approach the town, with lots of blind corners, a trademark of this section of the Carretera Austral. Being Sunday the town was fairly dead. There are a few basic shops but those were closed and our hopes of getting some information on Villa O'Higgins and crossing into Argentina, were not to be fulfilled. 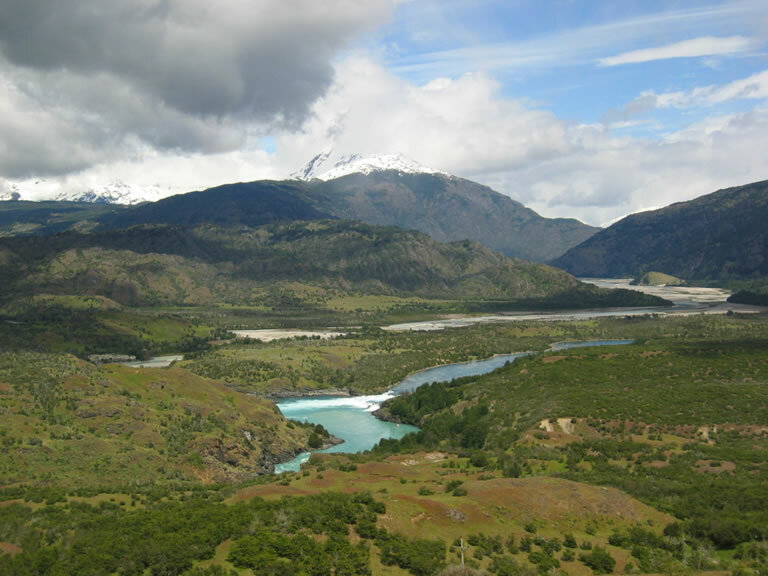 We spent a few minutes wandering around, stocked up on Diesel (Cochrane is the last place on the Carretera Austral with a petrol station) and moved on to Caleta Tortel, where we were hoping to spend the night.